13 Extra! Extra! 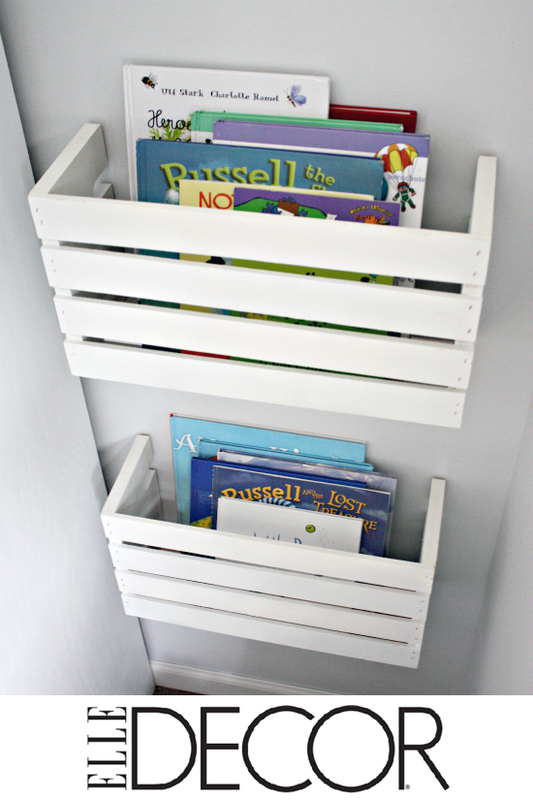 Organizing Reads! There has definitely been a lot going on behind the iHeart scenes lately. My shop has been super busy this month and I couldn't be more appreciative of your sweet support! To say thank you, I am offering 20% off everything through this Saturday, January 17th (not valid on prior purchases) with code IHEARTYOU20. We have also been making progress in the kitchen now that the holidays are over! Woot! Feels great to finally be getting our hands dirty! Funny thing is that we are working on it as often as we can, yet really don't have a single project done to blog about. So, I am thinking I will start doing a kitchen check-in every Friday, just to share progress and stay true to what a blog is really intended for; documenting the journey. Hoping to get one out this week yet! With all that we have going on, I have had a hard time adding extra project posts to my lineup, so I thought I would stop in to share where you can find a few more organizing related reads that I have worked on, including my most recent posts on the Better Homes & Garden's Style Spotter's Blog. Although the holidays have come and gone, you can be create a holiday ready home far in advance this year! 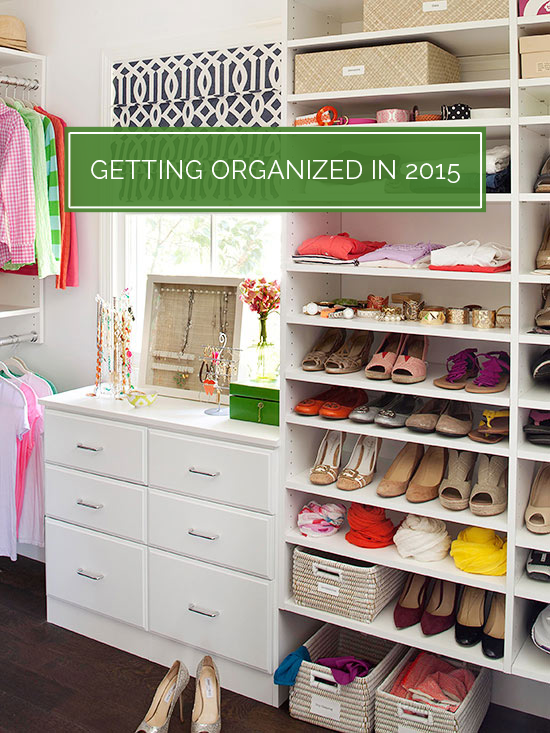 I chatted about my personal goals to get organized in 2015 here, and over at BHG I broke it down even more. 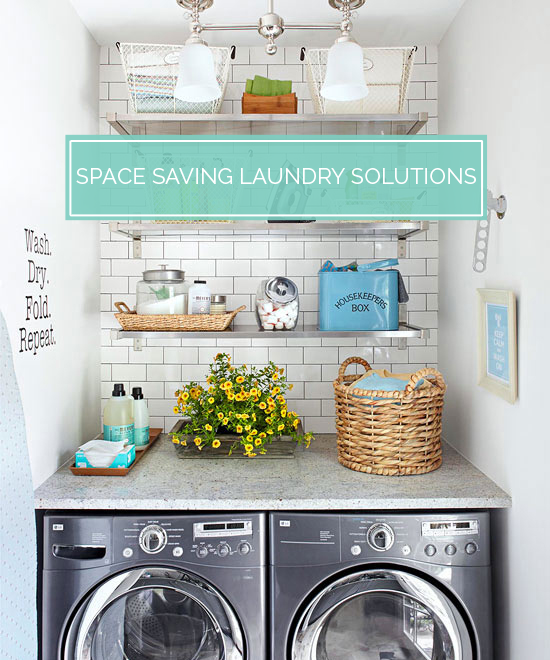 Not all laundry spaces are created equal, and most require you to get creative and truly maximize the space available. 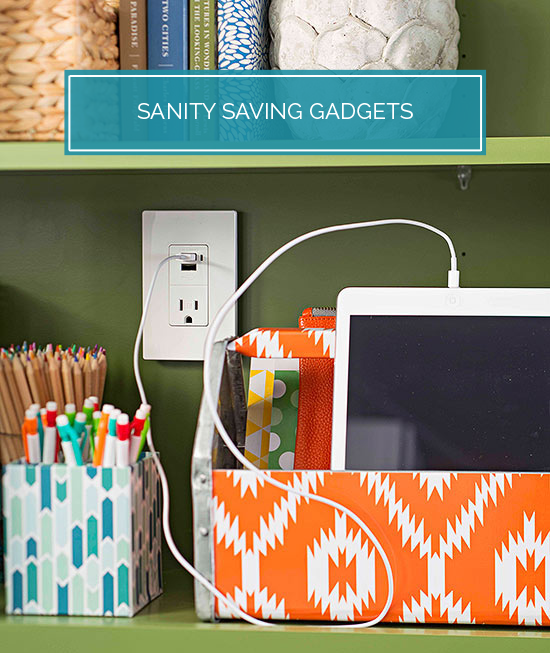 As much as I love organize my home with good basket, there are times when gadgets can make the day run smoother as well! You can also spot iHeart Organizing being featured at a few fabulous places around the web. One that may have knocked me right out of my chair is the Elle Decor shout-out, where they shared 15 Storage Solutions to Make Your Life Easier. My pals over at Good Housekeeping rounded up some pretty fantastic closets, and it was such an honor to be included! When I first started blogging, I always loved reading a good magazine, but never thought I would actually be featured in one. I still pinch myself each time it happens and count my lucky stars that big things can happen to those with big hearts. Whenever I partner with a magazine, I still feel big happy butterflies, become school girl giddy and call everyone in my family. Every opportunity I have had to collaborate with a publication has come due to all I have learned right here on this blog over the years. 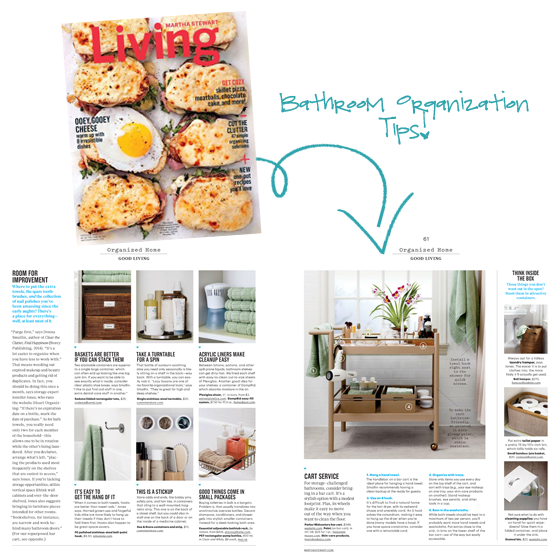 I kicked off 2015 with a first, which was being published in a UK based magazine, Living Etc! This magazine looks really fantastic, covering all topics home and lifestyle. A friend is sending me a copy in the mail and I can't wait to flip through the beautiful pages! 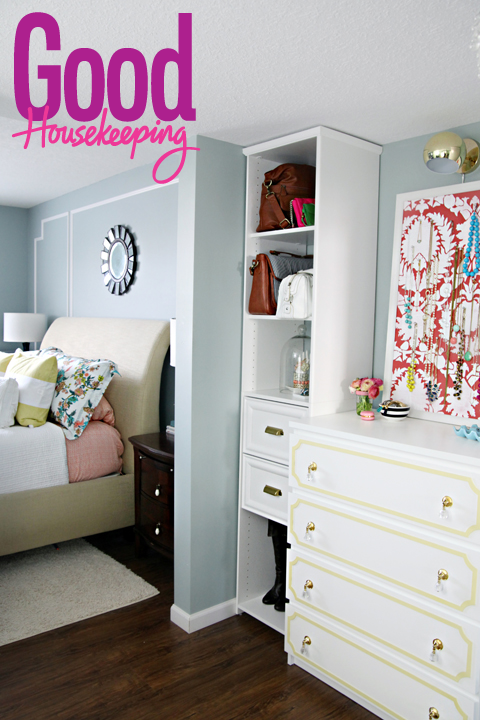 Remember that one time I surprised a local friend with a top-to-bottom craft room overhaul? I think it is safe to say that the project has filled my heart with more joy than any other. 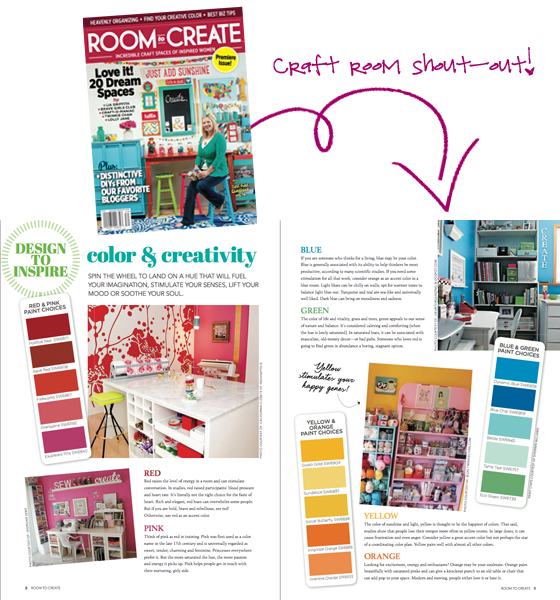 Knowing how special the project is made it even more exciting to see it mentioned in the premier issue of Room to Create! I have a few business bucket list goals, and was able to check one really big box off of my list. I am not sure if any of you are familiar with the super talented Martha Stewart (of course you are! ), but this girl right here may have been asked to offer advice and tips in the February 2015 Martha Stewart Living magazine! Say WHAT?! I have looked up to Martha since long before becoming a homeowner. The work done by her and her team has always left me feeling motivated and encouraged to do great things within our own home. I love her clean and simple style, her beautiful products and of course her website, magazine and books. To say I am now a tiny piece of one of those publications gave me good reason to pop the cork and sip some champagne. This little site of mine, I'm gonna let it shine! IHeart Organizing was included in this year's Working Mother's Best of the Net for 2015 list! I am lumped in with so many other sites I admire and love, so I am feeling pretty smitten with the news. Woot! And last but certainly not least, a GIANT thank you to everyone to expressed interest in my 2015 contributor openings! The response was absolutely INCREDIBLE! I know I have been doing a lot of gushing already, but I felt so incredibly blessed to have such a talented group of folks write in and share with me their love for all things home and organizing. I finally have narrowed it down to add a few new fresh faces and am in the process of finalizing all communications. Contributors start back up next week, so stay tuned for updates to my sidebar and the My Team tab at the top of the page. I couldn't be more pumped about what is ahead! And a very important reminder that this blog would not be possible without my monthly sponsors. They are each amazing companies that I love and support right back, you can check each of them out below or on the sidebar. Two weeks are remaining to link up your organizing projects as part of this month's organizing challenge! Check them out and link up here! So happy for all of your accolades. You deserve every one. A big congrats to you! Those are some fabulous features. Congrats on all the shout outs! Congratulations on all of your accomplishments and accolades! I've been reading and following for a while, you deserve it! Super Congrats! You totally deserve it! I was just reading MS Living the other day (which I somehow get for free) and saw you in there! I was excited for you! I just picked up a copy from Barnes and Noble this evening, I have heard that Target and Hobby Lobby are other retailers that should be offering it. I haven't paged through it yet, but looks like it will be good! Congratulations, Jen! What awesome features, and so well deserved. I'm working on our garage organization right now and your site is my main go to. Thanx so very very much for all the wonderful info you provide for the organizing challenged among us. You are a super star.